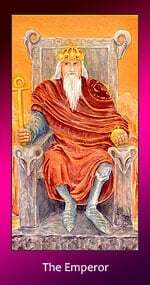 The Emperor card has selected you to let you know that you sow seeds of better things and more fulfilling times ahead. Give yourself permission to reach out for more, especially if you are dissatisfied. You create a solid foundation, built on a sense of higher purpose. If your current relationship suffers from stress, today let tender actions reveal what you may be unable to put into words. Rebuild, from the ground up.